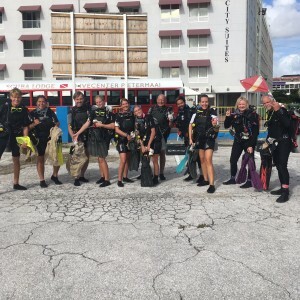 WILLEMSTAD - On Sunday, December 2, the diving instructors of Scuba Lodge Dive Center Pietermaai organized their last cleaning dive of the year. Since 2017 the diving school organizes a cleaning dive with Project AWARE every first Sunday of the month. During these dives, together with volunteers, they clean the house reef of Scuba Lodge by removing plastic, bottles, fishing lines and other waste. 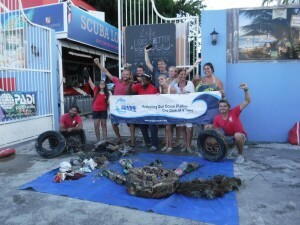 On Sunday, however, the cleaning dive was held at Marichi, the beach in the heart of Punda. During the dive, which involved about 15 volunteers, the divers mainly collected bottles, plastic waste and various car tires from the sea. There were also several garments and several tin cans. Among the volunteers were residents of Curacao, tourists and students. The youngest volunteer was the 10-year-old environmentalist Lilly Platt from Lilly's Plastic Pickup. While the divers were cleaning underwater, Lilly and her parents helped by collecting plastic and other waste on the beach. Scuba Lodge will continue this monthly initiative in 2019. The next clean-up dive is scheduled for Sunday, January 6, 2019.